I joined my former college classmates for the early portion of the Jim Finn Stag pub crawl, before everyone got incoherent. 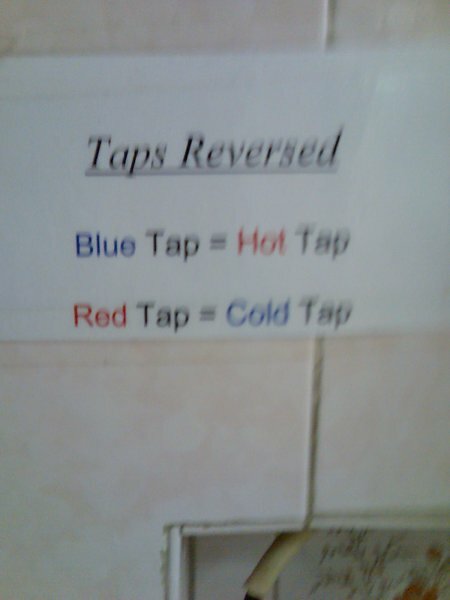 In the third pub, The Hut in Phibsborough, the bathroom had a sign about the incorrectly coloured taps. 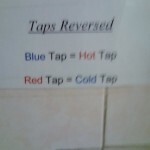 The blue tap gives hot water, the red tap is for cold water. That reversal must really get messy when the clients are drunk. Why couldn’t the owners either swap the taps, or the feed pipes or even the coloured plastic at the top of the taps.